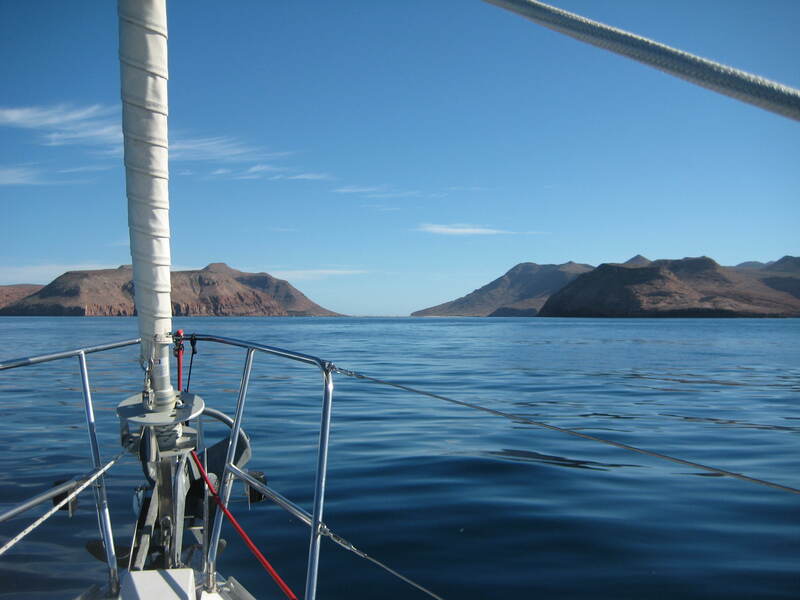 The morning of Friday the 3rd found us up and running towards Isla Partida, specifically to the anchorage of Caleta Partida, to join our friends. The short trip (two hours) was such a visual feast! 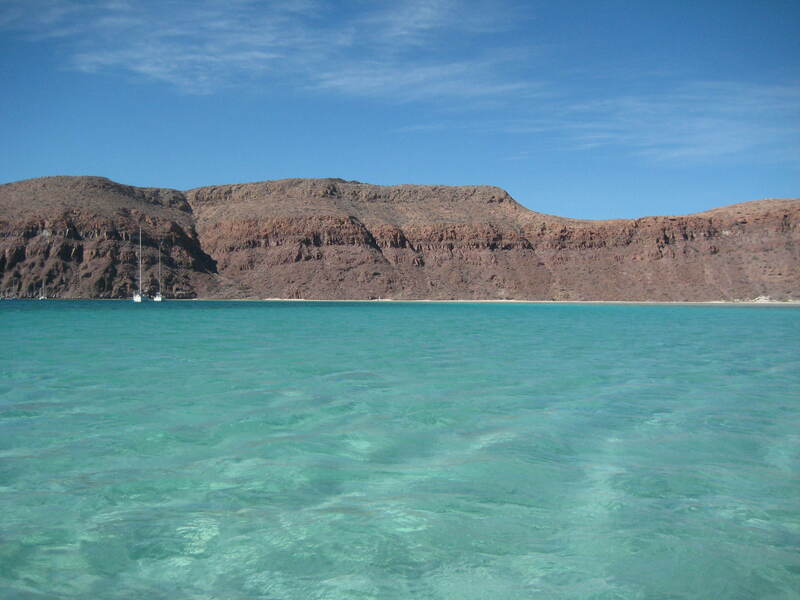 We travelled quite close to Isla Espiritu Santo and I was scanning the coast with my binoculars so intently that I thought my eyes would pop out of their sockets. 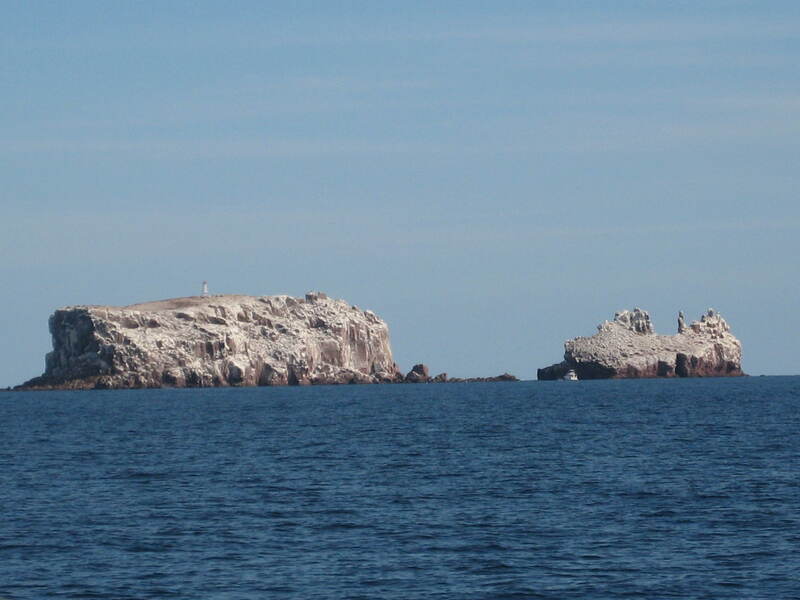 Isla Espiritu Santo and Isla Partida are two islands separated just by a narrow channel, they are a Natural Marine Park protected and preserved by the Mexican government. 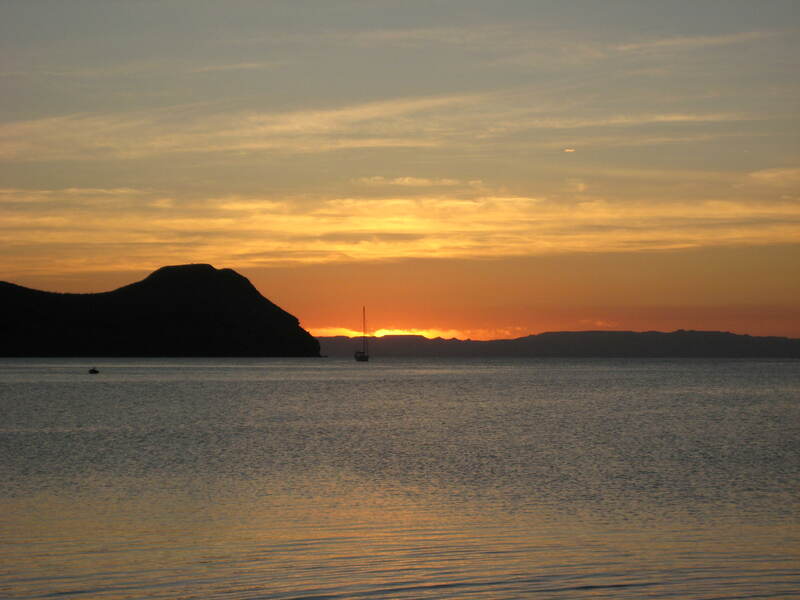 This region serves as a breeding ground for sea lions and marine turtles. It is also a migratory corridor for 210 bird species and there are about 500 fish species in this area. 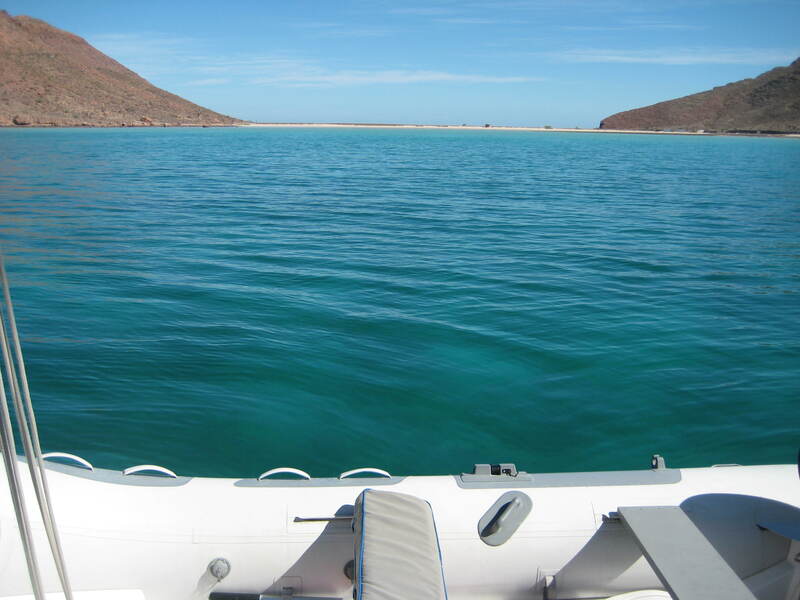 The Sea Of Cortez is home to 31 species of dolphins and whales – one third of the world’s total! I really want to take my time visiting this incredible place. The arrival at our destination was nothing less than spectacular. 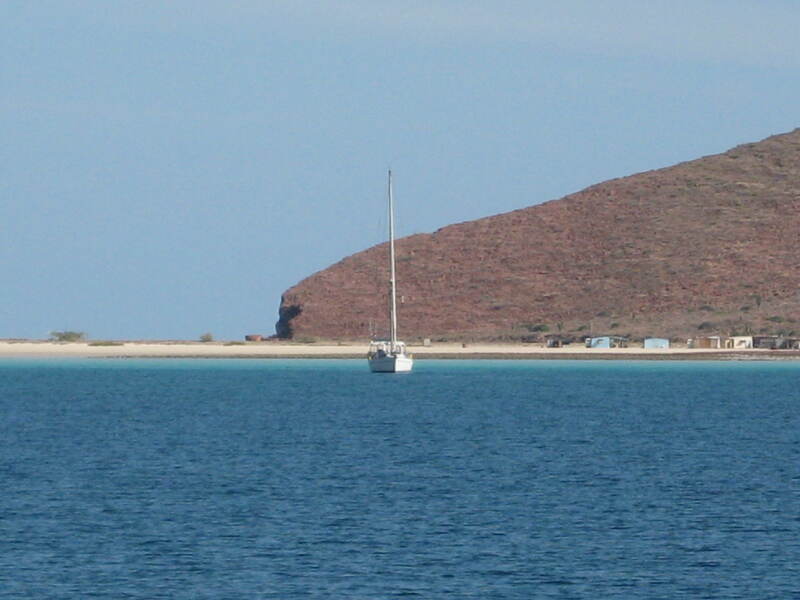 Caleta Partida is the crater of a large, extinct volcano. The colors of the water looked just like a picture out of a travel brochure. 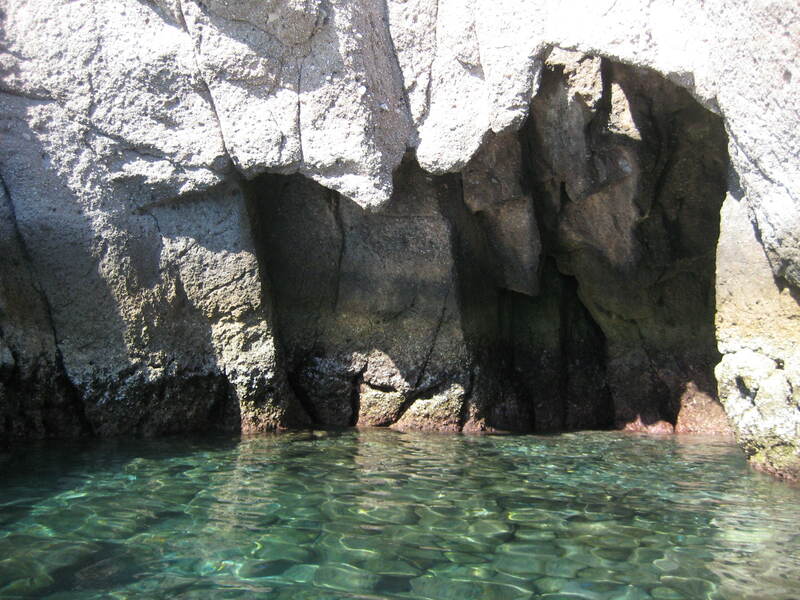 We got there mid-morning, the water was smooth as a mirror, we had plenty of time to run around in the dinghy and explore the nearby sea caves. There were about 12 boats anchored in the little cove with us and we knew most of them, so about an hour before sunset we all raced to the small beach to have our customary Sundowners Time and watch the sunset. I cannot even attempt to describe the colors and the contrasts of the spectacular scenery. But I can tell you that I saw a Jack Rabbit as big as a mid-size dog running around, and boy was he fast! I say we blend in perfectly! 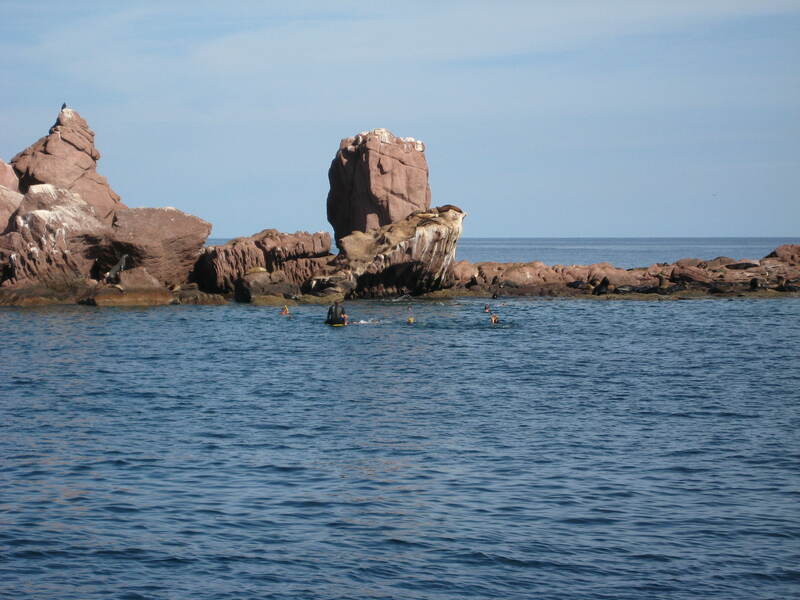 The next morning, along with 15 other friends we piled up aboard Perfect Wave, the most spacious and most luxurious boat in our group, to go for an excursion about half a mile north to Los Islotes, two rocky islets famous for their sea-lion rookery. 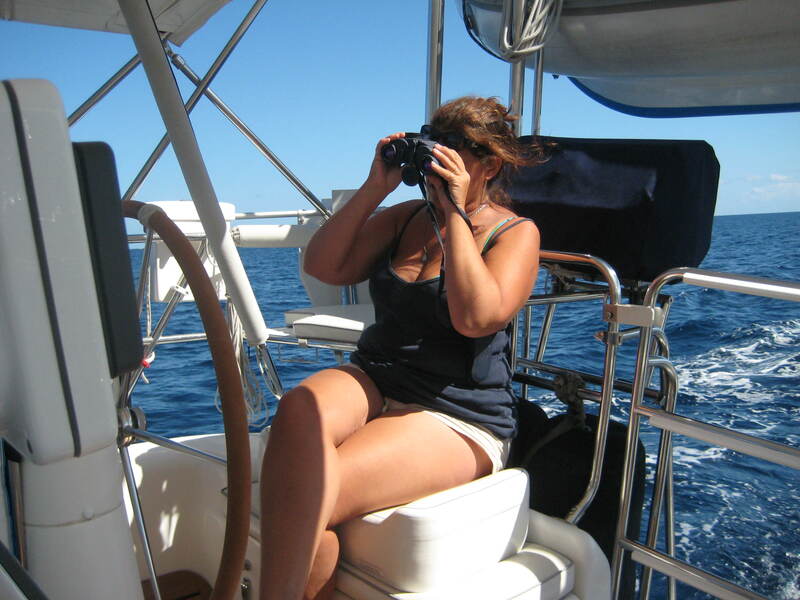 As we got closer to our anchoring spot the barking became almost deafening, they sure are vocal! . We were all eager to go swimming with these friendly, huge mammals and in just a few minutes off we dived, armed with fins and snorkels, with our hands carefully tucked under our armpits. We were warned that it’s not wise to wave your hands around, as they may be mistaken for tasty treats… These animals are certainly not shy, they like to swim very close to visitors and are very entertaining with their playful antics. Some younger ones playfully nipped at our fins, it seems to be a common fun game for them. 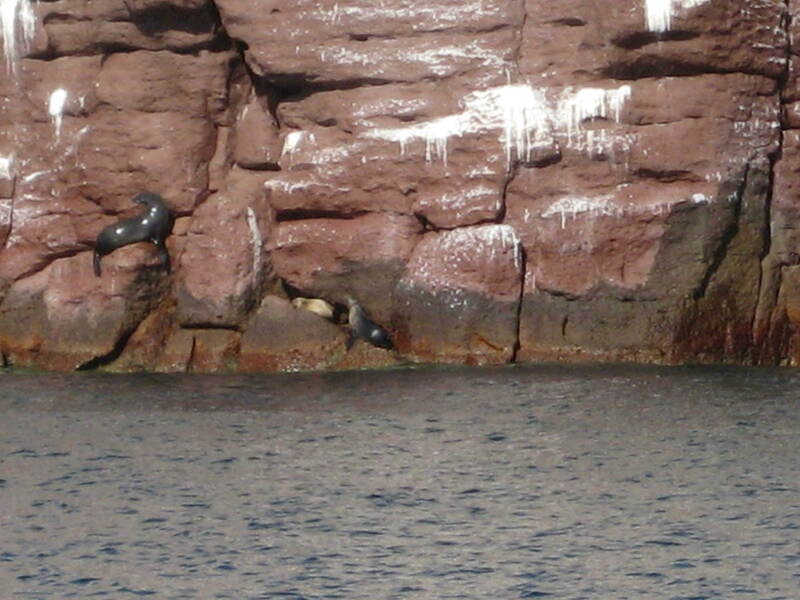 They are curious and smart, I was especially enthralled with a young female that came to rest against the anchor chain. After tentatively nipping the chain, she positioned herself comfortably with the chain under her right fin (like under her armpit) and proceeded to watch us with extreme interest. I’m not sure who was watching who… After the swim, while waiting for everyone to come back aboard, I was further entertained by this persistent pelican trying to get a fish too big for him. The fish looked like a Trumpet fish, narrow but about two feet long. 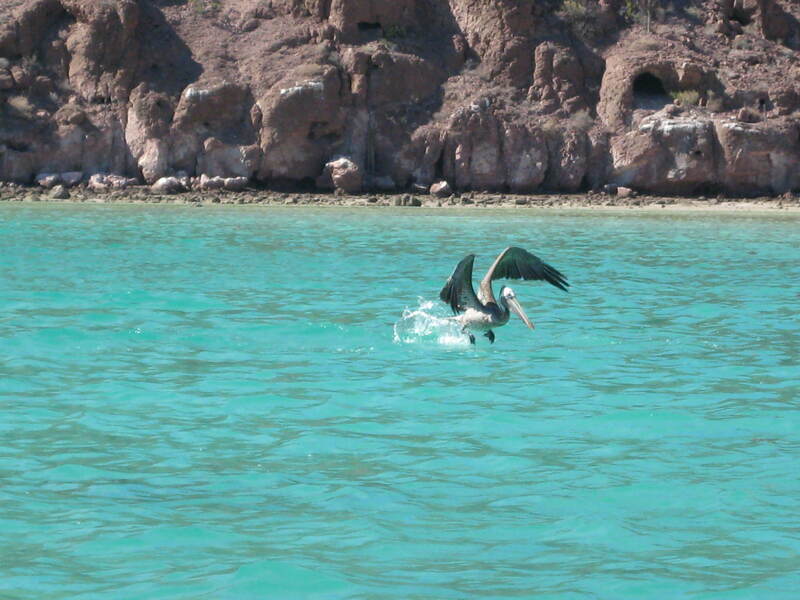 After a couple of near-misses and a drop or two, the pelican won. It was hilarious to see the big bird fly away with the fish stuck sideways in its gullet! Not even in my wildest dreams would I have imagined to be able to see all of this. 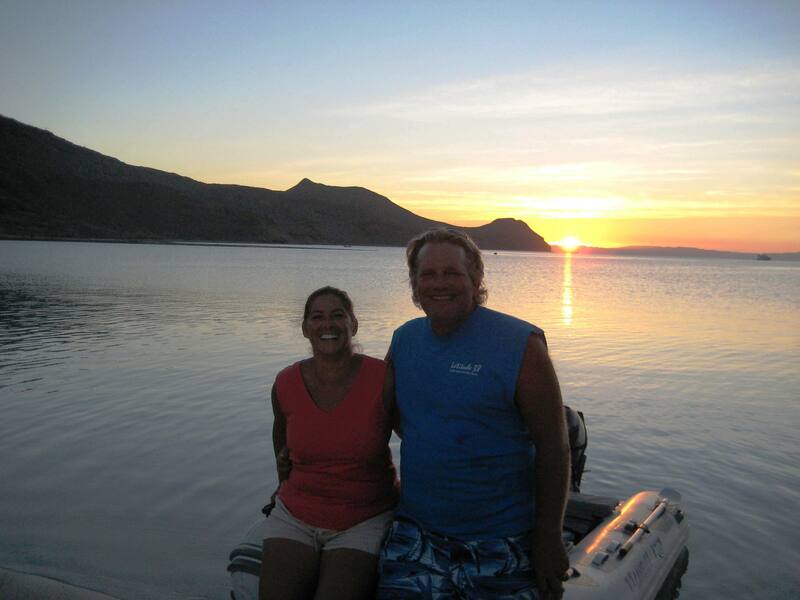 There’s plenty more to experience, but even here the waters are getting a little colder –it is December after all!-, it’s time to move a little farther South to find warmer waters. I’m happy to keep moving, as I know we’ll be back here next Spring to leisurely visit again.